This is a fancy-sounding dinner that really just means you can pull off an abundant meal of fish and vegetables with just 30 minutes and one pan. To make the dressing, combine all the ingredients in a small jar and shake vigorously. Set aside until ready to serve. 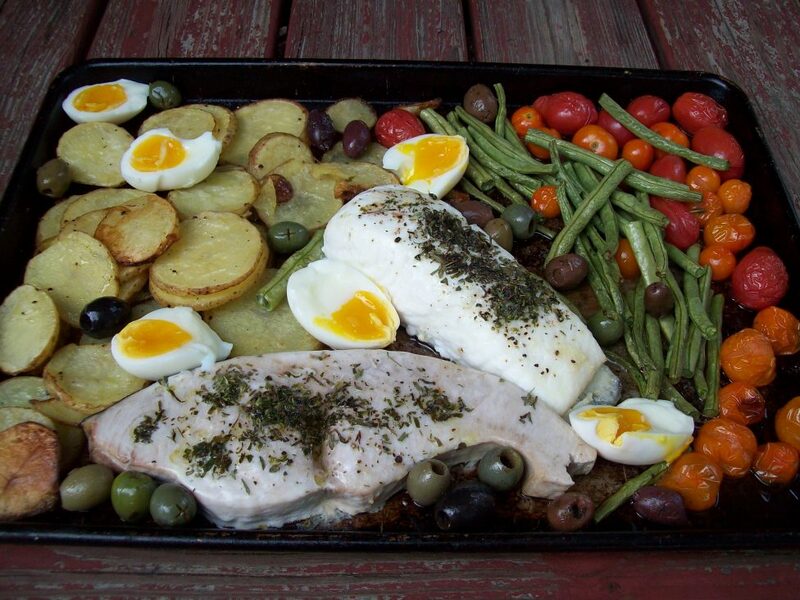 On a large rimmed sheet pan, toss the potato slices with 1 tablespoon of olive oil, 1/2 tsp. salt and 1/4 tsp. pepper. Shake the pan to roughly spread them out — don’t worry much about them overlapping. Roast the potatoes in the preheated oven for 15 minutes. While the potatoes are cooking, season the fish with the remaining salt and pepper, tarragon and oregano, and drizzle with 1/2 tablespoon of the remaining olive oil. In a small bowl, toss the green beans and tomatoes with the last 1/2 tablespoon of olive oil. After the potatoes have cooked for 15 minutes, remove the sheet pan from the oven and use a spatula to push them all to one side of the pan. On the other half of the pan, pour out the green beans and tomatoes. Make space for the fish and add that to the pan as well. Return the pan to the oven and roast for an additional 15 minutes, until the fish flakes easily with a fork. Remove the pan from the oven. Slice the eggs in half and arrange the halves around the contents of the sheet pan. Scatter the olives over the top and serve with the dressing on the side.